Proper planning is essential for protecting your turf from the myriad of pests that can attack during the season. In addition to pests, turf is also frequently subjected to abiotic stresses like heat, drought, traffic and shade. Taking into account your daily demands and how quickly the next season approaches, it is important to consider an agronomic plan. However, agronomic planning is becoming more complex with overlapping pest pressures, resistance management considerations, seasonal use limits on some active ingredients and tank-mix considerations. 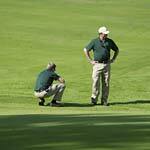 Agronomic programs from Syngenta are specifically designed to help your turf Condition, Perform and Recover. These tailored programs can help turf become fit before the season, provide improved turf quality for players and recover from stress in your region. Based on years of field research, we have created agronomic programs by region based on grass type, days of application and pest pressure, while adhering to proper resistance management strategies and seasonal use limits. Turf pests don’t have calendars – their growth and development is determined by weather parameters like temperature, rainfall and humidity, which vary widely from year to year. It is important to remember that the following recommendations for regional agronomic plans should serve as guidelines and should be modified as the season progresses based on prevailing conditions. 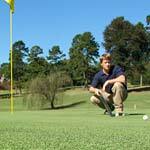 Fungicides: In the Southeastern U.S., agronomic programs mainly focus on golf course putting greens. Whether you are growing creeping bentgrass or ultradwarf bermudagrass greens, a broad-spectrum disease control program is needed to protect the turf from pathogen attack. While under the persistent summer heat stress, creeping bentgrass putting greens are most prone to diseases such as anthracnose, summer patch, Pythium root rot, fairy ring and brown patch. Alternatively, ultradwarf bermudagrass greens are most prone to diseases in the fall, winter and spring because of short day lengths and cooler temperatures. Bermudagrasses are not necessarily immune to disease during the summer; a preventive program to combat Rhizoctonia zeae and fairy ring is essential to summer maintenance of ultradwarf bermudagrass greens. Posterity® and Secure® Action™ fungicides are exciting new additions to the Syngenta portfolio for the most important diseases of bermudagrass putting greens. Secure Action is recommended in the fall and spring for leaf spot control and suppression of Pythium blight, and when tank-mixed with Appear® fungicide has been shown to improve turf quality through the winter and spring. Two fall applications of Posterity + Headway® fungicide (7 + 65 fl. oz./A) are recommended for combined control of spring dead spot and take-all root rot, further assuring a rapid, uniform spring transition. On golf course tees and fairways, preventing spring dead spot and large patch disease on bermudagrass and zoysiagrass requires planning. Two fall applications of either Velista® or Headway fungicides are recommended when soil temperatures decline to 70° F to prevent both spring dead spot and large patch. For optimal large patch control, a third application during spring green-up is often necessary to prevent spring outbreaks. Refer to the Large Patch Prevention Assurance Program for rate and timing information for your area. Nematodes are widespread turf parasites in the Southeastern U.S., especially in sandy soils where sting and lance nematodes are predominately found. Just like fungal diseases, effective nematode management requires a season-long approach that incorporates multiple modes of action. Syngenta recommends incorporating Divanem® nematicide to provide season-long nematode control. Tank-mixtures of Divanem with fungicides like Velista and Heritage® Action™ are also employed to control fungal diseases like take-all root rot, summer patch and Pythium root rot that often infect roots damaged by nematode feeding. 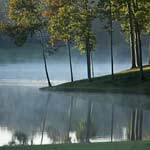 Insecticides: Insecticide applications are critical to protect greens, tees and fairways in the Southeast, with Acelepryn® insecticide as the foundation. Applications of Acelepryn beginning in March, depending on geography, provide excellent control of white grubs and billbugs as well as long-term prevention of caterpillars such as black cutworm and fall armyworm. Where mole crickets are a problem, two applications of Provaunt® insecticide two to four weeks apart, beginning after egg hatch, are recommended to provide 90 days of control through the Mole Cricket Assurance Program. Lastly, the Advion® Fire Ant Bait Guarantee Program provides season-long control of these dangerous pests, which have become pervasive in the Southeast. Herbicides: Weed pressures are a year-round concern in the Southeastern U.S, but few options are available for post-emergence control of grass weeds. Manuscript® herbicide is a new option for control of crabgrasses, tropical signalgrass and more with outstanding safety to bermudagrass and zoysiagrass turf. Manuscript performs well in spring, summer or fall, and with its rapid activity against certain weeds and turf safety, it can help ensure rapid grow-in of the desirable turf species. Fungicides: Turfgrass diseases vary in the Midwest based on location and turf species. Managers of cool-season turfgrass species on greens, tees, and fairways should plan for preventive fungicide applications to control anthracnose, summer patch, Pythium, brown ring patch, take all patch, dollar spot, and in northern regions, pink and gray snow mold. Fairy ring can affect all species throughout the region, and can be an important disease to consider when creating disease control programs. Fungicide applications of Velista, Briskway®, Secure Action and Heritage Action should be planned to focus on these key turf diseases. Posterity and Secure Action are valuable new tools for combatting dollar spot, and can be cornerstones of a fairway program for the Midwest. Posterity is the most active dollar spot fungicide available, providing 14 to 28 days of reliable disease control. Secure Action is a new and improved formulation of Secure fungicide, incorporating acibenzolar-S-methyl to offer extended dollar spot control and increased tolerance of heat and drought. Although it still feels like summer, it will be snowing before you know it, so it’s time to start planning for snow mold prevention. The Snow Mold Assurance Program from Syngenta includes Instrata® fungicide for greens and tees and Contend® fungicide for fairways to protect your golf course through the winter and ensure a uniform green-up in the spring. Insecticides: In the Midwestern U.S., white grubs are the most important insect to control. Other pests like cutworm, and occasionally armyworm, are also found on greens and tees. Preventive applications of Acelepryn, granular or sprays are more effective than curative applications, so be vigilant about application timing as each insect is unique. In the upper Midwest, the European crane fly can be a devastating pest in fine turf. Consider fall applications of Acelepryn or Provaunt for control of young larvae at their most susceptible life stage. Herbicides: Pre-emergence applications should be properly timed to control annual grass weeds in turf. Typically, pre-emergence herbicides, like Barricade® brand herbicides, are applied in the early spring for summer annuals such as crabgrass and Poa annua. Most dicots and sedges can be controlled with post-emergent herbicides, like Tenacity® herbicide, applied while the weeds are actively growing. Pre-emergent applications for winter annuals, such as annual biotypes of Poa annua, are made in the later summer months. Post-emergence control of crabgrasses and certain other grassy weeds in bermudagrass and zoysiagrass turf can be achieved with the new Manuscript herbicide. Weeds in native or fine fescue areas can be targeted with Fusilade® II herbicide. Nuisance grass weeds like smooth brome and foxtail can interfere with a pure stand of fine fescue, and Fusilade II is effective at selectively controlling these and other species. Plant growth regulators (PGRs): Integrating PGRs into a season-long agronomic program can improve turf quality and enhance surface playability. PGRs like Primo Maxx® and Trimmit® 2SC reduce vertical turf growth to slow down clipping production, and are useful for increased rooting and tensile strength, and improved tolerance to common turfgrass stresses like drought, shade and traffic. If Poa annua reduction is a desirable objective for creeping bentgrass putting greens, consider incorporating Trimmit into the program to gradually transition to higher creeping bentgrass populations. In certain situations, it may also be desirable to tank-mix PGRs (for example, for cool-season fairway clipping reduction, mix Primo Maxx and Trimmit). Fungicides: Fungicide applications should be planned to focus on key turf diseases in the Northeast based on location and turf species. Managers of creeping bentgrass/Poa annua greens should plan preventive fungicide applications for control of anthracnose, summer patch, Pythium, brown ring patch, take-all patch and dollar spot. Tank-mixing and rotating fungicides are key to successful agronomic fungicide programs. Agronomic programs from Syngenta provide guidance for selecting fungicides to achieve optimal disease control. Secure, Daconil® Action™ and Medallion® SC brand fungicides provide contact activity, while Velista, Briskway, Heritage Action, Headway and Banner Maxx® II fungicides are excellent choices for systemic fungicides. Posterity and Secure Action are exciting new tools to help combat dollar spot in the Northeast. As the most active dollar spot fungicide available, Posterity provides 14 to 28 days of reliable disease control. As a new and improved formulation of Secure fungicide, Secure Action incorporates acibenzolar-S-methyl for extended dollar spot control, and increased tolerance of abiotic stresses like heat and drought. Effective snow mold prevention requires advanced planning. The Snow Mold Assurance Program from Syngenta includes proven snow mold solutions based on years of field research. Instrata is recommended for greens and tees and provides up to 130 days of snow mold protection. Contend is recommended for fairways and higher heights of cut, providing up to 110 days of protection. Insecticides: Insect control is important for maintaining turf in the mid-Atlantic and Northeast regions. White grubs, cutworms and ABW are the primary insects. An application of Acelepryn in the spring can provide the base control for all three insects. However, preventive applications that target ABW development will require applications of Ference®, Provaunt and Scimitar® brand insecticides as well. Register at WeevilTrak.com for additional information. Herbicides: With weed populations varying across the East, herbicides that are applied while weeds are actively growing can provide post-emergence control. Pre-emergence applications should be properly timed based on geographic location to control annual grass weeds in turf. A pre-emergence herbicide, such as Barricade, is effective for controlling summer annuals like crabgrass and goosegrass, and is typically applied in the early spring. Herbicide applications for winter annual (such as biotypes of Poa) are made in the late summer. 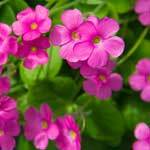 Tenacity can be applied in the fall for control of winter annuals and weeds in newly established turf. For native fescue areas, use Fusilade II to control unwanted grasses like crabgrass. Fungicides: Diseases vary in Western U.S. states, based on location and turf species. Managers of Poa annua greens need to plan preventive fungicide applications to control anthracnose, summer patch, Pythium, brown ring patch, pink snow mold and rapid blight. Bentgrass greens are susceptible to Rhizoctonia spp., Pythium, take-all patch and snow molds. Warm-season grasses such as bermudagrass and seashore paspalum are susceptible to Rhizoctonia spp., dollar spot, Pythium and bermudagrass decline. Fungicide applications should be planned to focus on these key turf diseases. Daconil Action and Secure are contact fungicides that are the base applications of a greens disease control program. In all winter overseeding programs, preventive applications of Heritage® G and/or Subdue® GR fungicides are needed at seeding, including a follow-up application 14 days later, to ensure damping-off diseases don’t reduce turf establishment. Insecticides: Billbug issues are common in the Western states of the U.S. Preventive applications of Acelepryn as broadcast or targeted sprays are more effective on these pests than curative applications. Masked chafer grubs are found periodically on the West Coast, so mapping areas with grub or animal damage will help target the control measures as damage grows. Having a preventive plan in place will help control these insects in areas of high grub damage. Other common greens and tee pests are BTA, Aphodius, sod webworm and cutworm, all of which should be considered while planning product usage. A product with a long residual like Acelepryn protects turf from most of these insect pests. In the Pacific Northwest, both common and European crane flies can cause turf damage. Pest outbreaks can be treated curatively with Provaunt, but preventive insecticide applications will reduce the collateral turf damage from birds and volume of dead larvae. PGRs: Primo Maxx is widely used on all grass species, from Poa annua and ryegrass to bermudagrass and kikuyugrass, to reduce vertical growth and clipping production, as well as to improve quality, stress conditioning and playability. Primo Maxx also helps reduce water loss, which is a key benefit as the cost of water increases. For winter overseeding, Primo Maxx can reduce competition from bermudagrass to enhance overseeding establishment. Trimmit has more specialized uses, such as Poa annua control on bentgrass greens and overseeded ryegrass fairways. It can also be combined with Primo Maxx for enhanced growth regulation of bentgrass and ryegrass fairways. For more information about Syngenta agronomic programs, receive a free agronomic program poster tailored for your region or visit ConditionPerformRecover.com. You can also download the GreenCast® Turf App from the Apple® App Store or the Google Play Store to help streamline the tank-mixing calculation and record-keeping process. ©2018 Syngenta. Important: Always read and follow label instructions. Some products may not be registered for sale or use in all states or counties and/or may have state-specific use requirements. Please check with your local extension service to ensure registration and proper use. Divanem and Scimitar GC are Restricted Use Pesticides. The trademarks displayed or otherwise used herein are trademarks of a Syngenta Group Company or third parties.